Touring the construction site at Southwestern Central School, Superintendent Maureen Donahue was excited and relieved that phase three of a 2015 capital project was almost complete. “This is all the end of a culminating project,” Donahue told The Post-Journal regarding the multi-phased capital project. The primary changes to the school from the current phase of the project involve the auditorium and a newly constructed gymnasium. The Erie-based Perry Construction Group serves as the general contractor. Other changes included renovations to Science, Technology, Engineering, Arts and Music (STEAM) rooms. Donahue said construction that will continue through the beginning of the school year will not impact any instruction. She said the creation of the new gymnasium, where new flooring was being laid on Monday, was a priority because of the condition of the current high school gym that includes structural issues, a need for new bleachers and lighting replacement. Renovations are planned for the current gym and is scheduled to be converted into a multi-purpose room and wellness center. The new gym, including its athletic facility entrance, is much larger than the old one with more bleacher seating and additional space in-between the main court and bleachers. Perry Construction Group lifted the first wall into place in February. The gymnasium will feature a new video scoreboard that will be accessible and available for teachers throughout the school to utilize for various instruction. When the new gym is finished in November, Donahue said the older gym will then begin to be renovated. The facility has two large sections of windows with an image of the school’s mascot, the Trojan, that’s visible inside and at night from the outside. 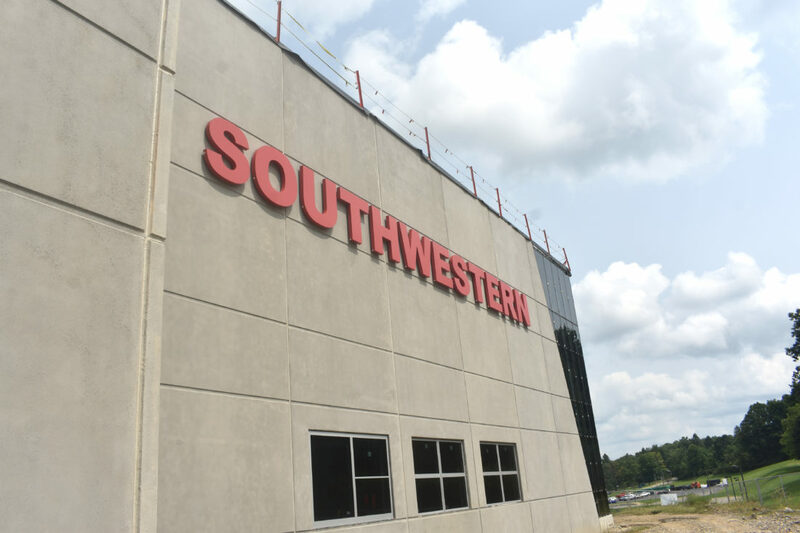 Additionally, the outside wall of the gym features a large Southwestern sign that lights up. The gym will also feature a new video scoreboard that will be accessible and available for teachers throughout the school to utilize for various instruction. In the auditorium, the district overhauled its sound and lighting systems. The systems are now digital and can be controlled remotely with a computer during performances. The new sound system added more free space while expanding its capability and power. “It’s an eighth of the size (of the original system),” Donahue said. She said the school staff will be trained how to use the new systems next week. There are now more than 200 different lighting choices for future performances. Additional improvements include a new stage rigging system, new digital screens, a new curtain, complete refurbished seating, a new vestibule entrance and additional detailing to the auditorium ceiling and walls. “There’s less of things (in the auditorium), but (they’re) more powerful,” she said. The auditorium is scheduled to be finished by September while the gym will not be complete until November. 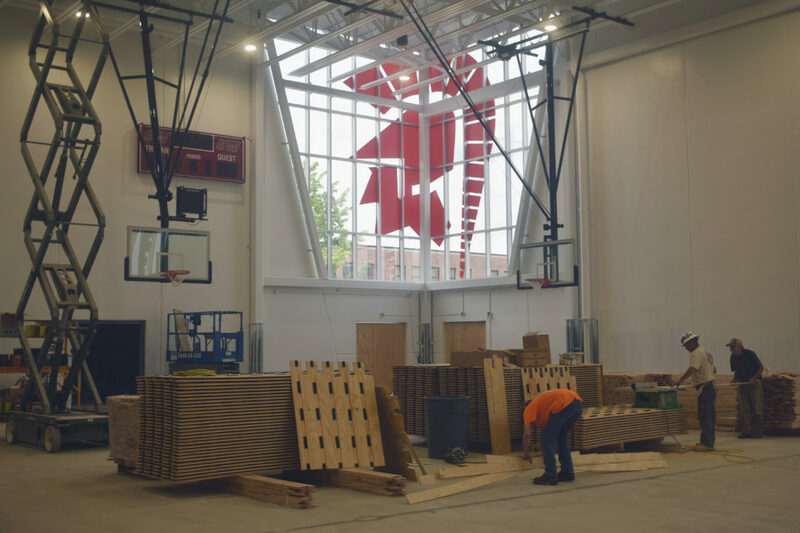 The district will hold the gymnasium’s grand opening during a girls and boys basketball game in December. Complete work for phase three of the capital project will officially be complete by January, according to Donahue. When the project is finished, Donahue said a new project will likely begin the following summer. She likened the district’s projects and constant maintenance to owning a house and all the subsequent work. Donahue said she’ll be glad when the gym is complete and noted that the feedback from the community has been positive.